Coffee is serious business in home building. 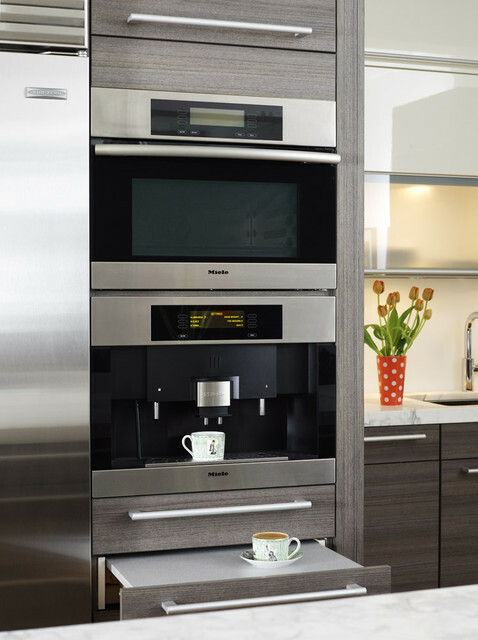 Whether it is as simple as making sure there is adequate counter space and outlets for the Keurig to a full built in home brewing system – our clients are obsessed with the bean. We get it! We also start our day with a strong cup and truthfully indulge in several cups as the day progresses. Built-In home brewing systems are a cool feature and one that might elicit a “wow” response from people visiting your home. They also brew one heck of a good cup of coffee. I was lucky to have the opportunity to try the Subzero-Wolf espresso at a local event and it was one of the best cups of espresso I’d ever had. If you drink a lot of coffee or entertain – the system might be worth it. Many of the systems allow you to brew two cups of coffee simultaneously, custom grind beans and another plus to built in systems is the automatic hot water features. This feature is useful for a quick cup of tea, easy bowl of oatmeal or instant hot chocolate for an after school treat on a frigid day. The manufacturers have their target audience in mind (busy, overwhelmed, slightly frazzled adults) most of the components are easy clean or dishwasher safe. The issue with a built-in brewing systems is that, well, things change. Anything built-in is a custom feature and will likely need to be exchanged sometime in the future. The coffee systems of the past did not offer milk steamers or sensitive brew temperature settings and are now obsolete. You need to ask yourself if you are willing to invest in a system and then be prepared to invest to switch it out. Some built-in systems are connected to plumbing and hard-wired for electrical so adapting the system would require a professional. Although most systems have fillable reservoirs and do not require sophisticated plumbing, updating a system may require possible modifications to cabinetry. Our advice? Do the math. If your family’s latte habit runs $5-$10/day (and many are even higher than that) you system will pay for itself in within 2 years. It will also save time, eliminate distracting coffee runs and allow you to brew your own perfect cup of coffee, latte or espresso to your exact specifications. Perfect coffee at home on a snowy Saturday while Netflix binging? Yes, please!